Yuukichan’s Papa is a pseudonym used by a group of sound designers who worked on the first two Mega Man games for the Nintendo Entertainment System. The real names of the composers who worked on Mega Man are Manami Matsumae and Yoshihiro Sakaguchi. The composers who worked on Mega Man 2 were Ogeretsu Kun (a pseudonym, which is a Japanese term of endearment for a rude person), Manami Ietel (another pseudonym, possibly for the previously mentioned Manami Matsumae), and Yoshihiro Sakaguchi. And Who Is Mega Man? Mega Man, known as Rockman (ロックマン, Rokkuman?) in Japan, is a video game developed and published by Capcom in 1987 for the Nintendo Entertainment System/Famicom. It is the first game to ever star Mega Man. Mega Man has been in several series and this is the first game in what is called the Mega Man Classic series. 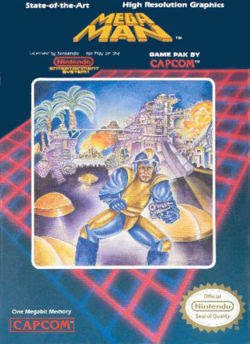 This first game established many of the conventions that would define several Mega Man series. Most notably, Mega Man established the setup of a number of stages, each with a Robot Master at the end that, when defeated, would pass on its unique power to Mega Man.